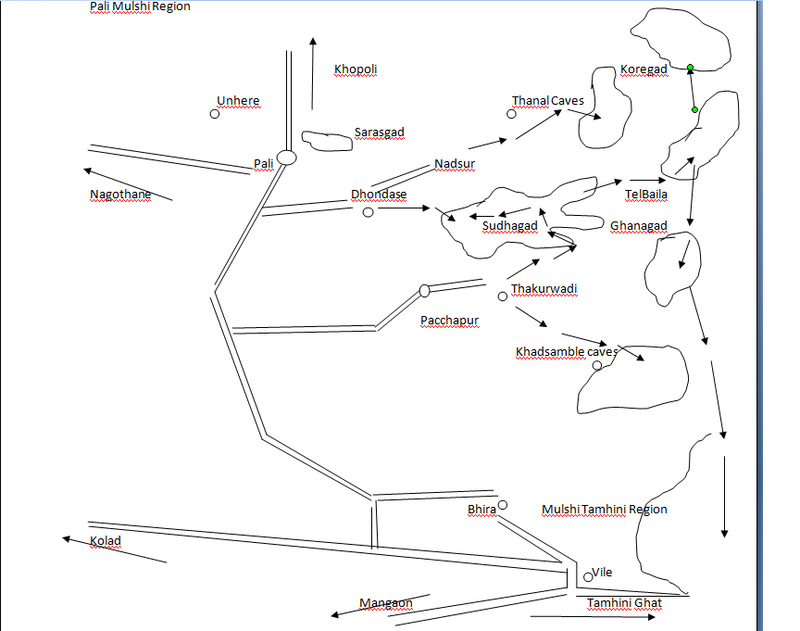 Basically the map has got information like base village and directions useful for the trek. Basically I have trekked till this region only.I have not gone beyond Koyna hence I have not published any map and information related with that . From Pune:Reach Saralgaon on Malshej-Kalyan road.Take right turn from this village and Further proceed to Dolkhamb( डोळखांब) via Shenwa(शेनवा).From Dolkhamb,further the base village Dehne is around 18 kms. Also from Dehne,you can reach Samrad (साम्रद ) by Sakurli (साकुर्ली ) ghat route and further by the Samrad Pachnai trek route,you can reach Ratangad and further till Harishchandragad. If ever you get a morning ST bus from Akole to Taaked (टाकेद ),you will be the luckiest person in world.Get down by that bus at Pattawadi.From there a straight route via the Ashram and caves takes you to the top. Taaked is a place of worship having a temple of Jatayu called sarvateerth built here hence it is accessible by bus and jeeps by a good road. Out of these three,Kulang can be done without rock climbing skills but since this fort provides a longest climb in Sahyadris,it is an exhaustive trek.Kulang can be done by those who has experience of climbing 15 to 20 difficult forts. Alang:From the col between Alang and Madan,you have two routes to go to top.The straight route is climbing the rock patch of around 30 to 40 meters with ropes and reaching the top of Alang. For rock climbers,there is a challenge in form of Duke nose near Khandala. 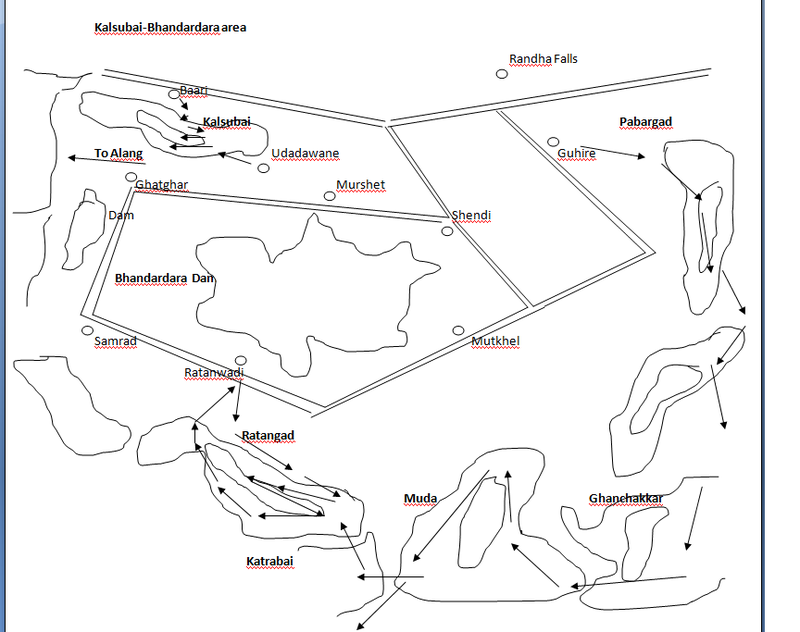 Also for seasoned trekkers,there is a difficult trek of Dhak Bahiri pinnacle near Rajmachi. This region is divided into two halves. The second part beyond Koyna dam comes under the Koyna wildlife sanctuary with lonely and deserted villages(there were villages before Koyna project was started but later on,these villages were submerged in waters of Koyna).There are dense forests all over and infested by bears and bisons all over. ***You need to take permission from forest department before going to Vasota-Nageshwar.Trekking without permission of forest department in this area is a legally punishable offense. 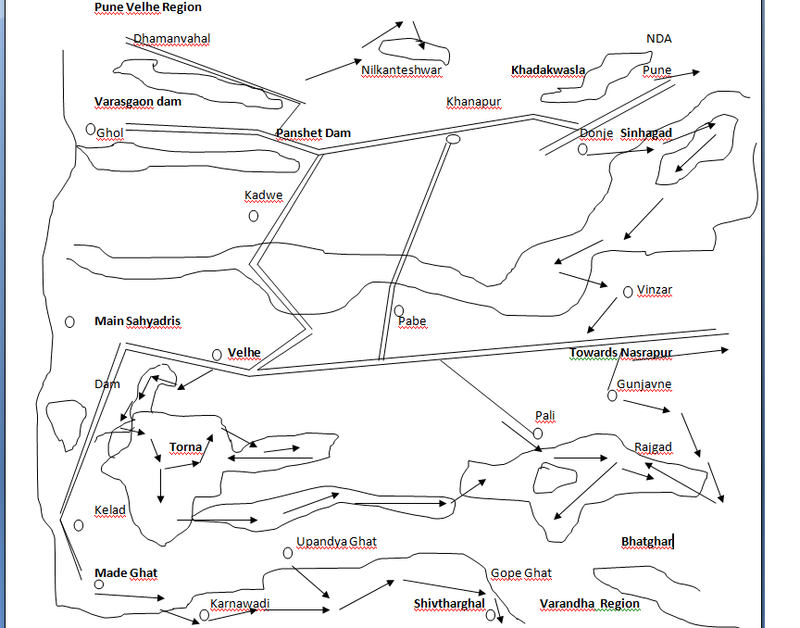 Basically Vasota is also divided into Old Vasota and New Vasota.At the last stage of climb to Vasota,you have two routes.To your right is Nageshwar Lingi and to your left is Vasota fort. 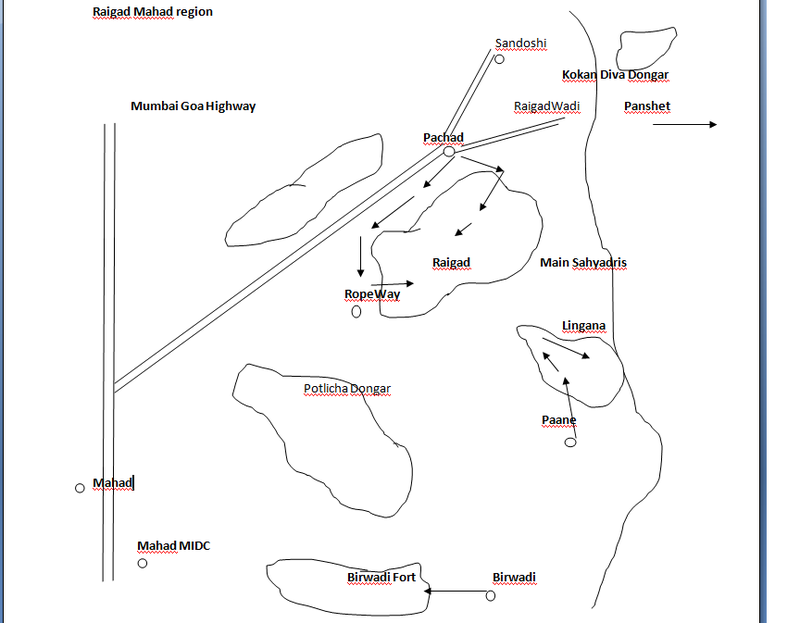 Also Vasota can be reached via Chiplun-Khed in Ratnagiri districts but the route is very very difficult. Ghonaspur is approximately 18 kms away from the main Poladpur-Mahabaleshwar road. 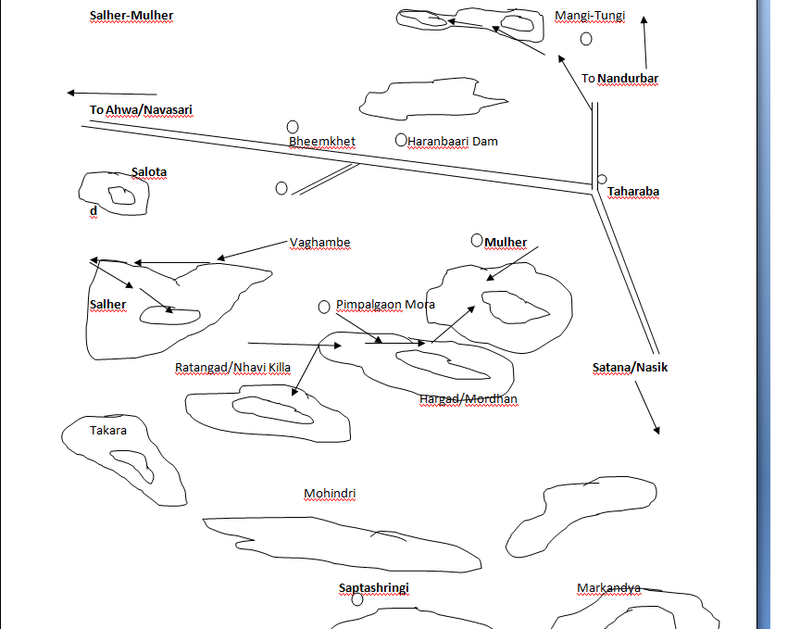 Basically in this region,Sahyadris are not continuos. Ramsej is one of the fort which made a big joke of huge army of Aurangazeb.Aurangazeb was well equipped with around lakhs of soldiers,cannons to capture Ramsej whereas Maratha army stationed on Ramsej after death of Sambhaji Maharaj was hardly 5000 plus but this simple fort was captured by Aurangazeb in 6 years. 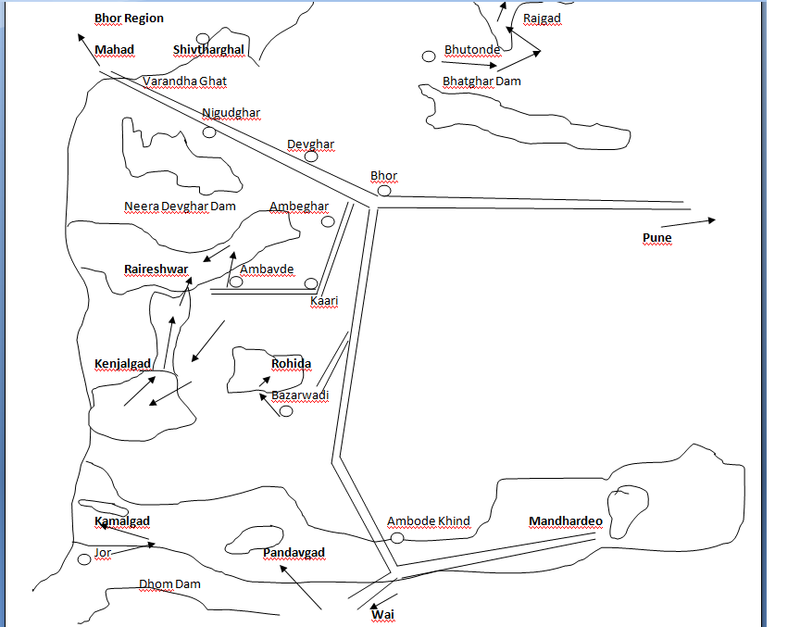 Bhorgad is also visible due to the radar on its top.You cannot go on the top of Bhorgad because entry is restricted and only defense personnels are allowed. 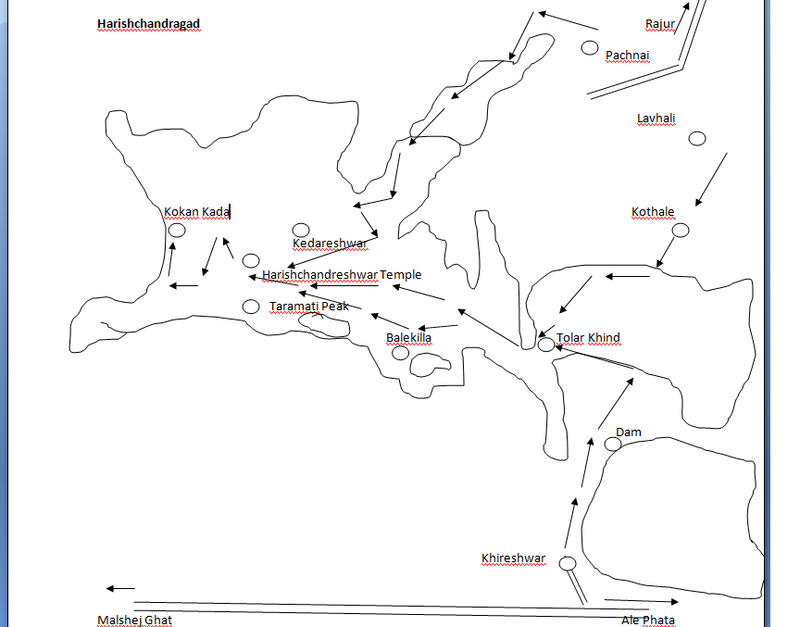 Further the forts like Harihar and Fani dongar are located ahead of Trimbakeshwar on the Jawahar-Mokhada road. 1)Easy one via Dhondase through which people from all ages right from a small kid to a old man can climb easily but it is very tricky and through dense forests hence hence chances of getting lost thats why not recommended without local guide. 2)A difficult route via Pacchapur-Thakurwadi;It is a long route with steep climb but straightforward route with no confusion. This bus reaches Nadsur around 11:00 am. There are also other trek routes from Torna via Boratyachi Naal or via Kawlya ghat near Panshet which descends down in Konkan. This region has many forts. 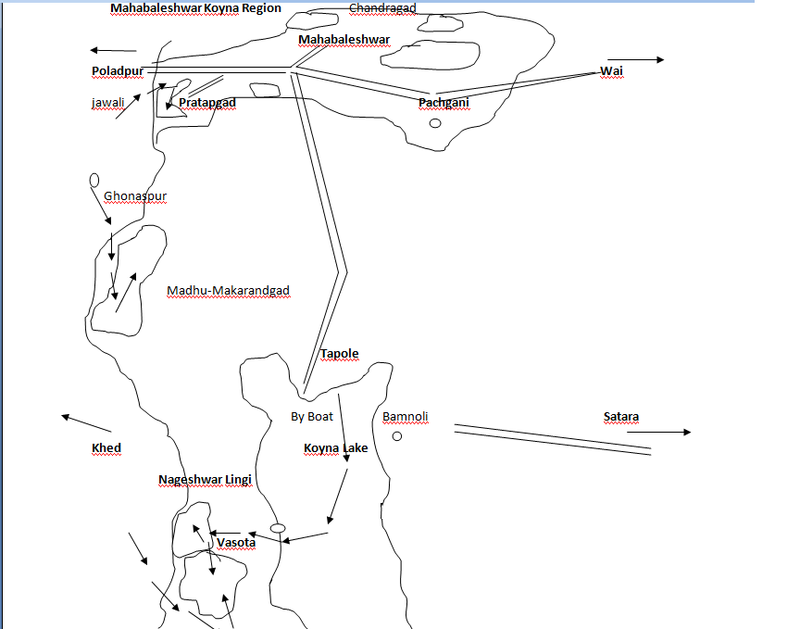 Salher is located in Satana taluka of Nasik. 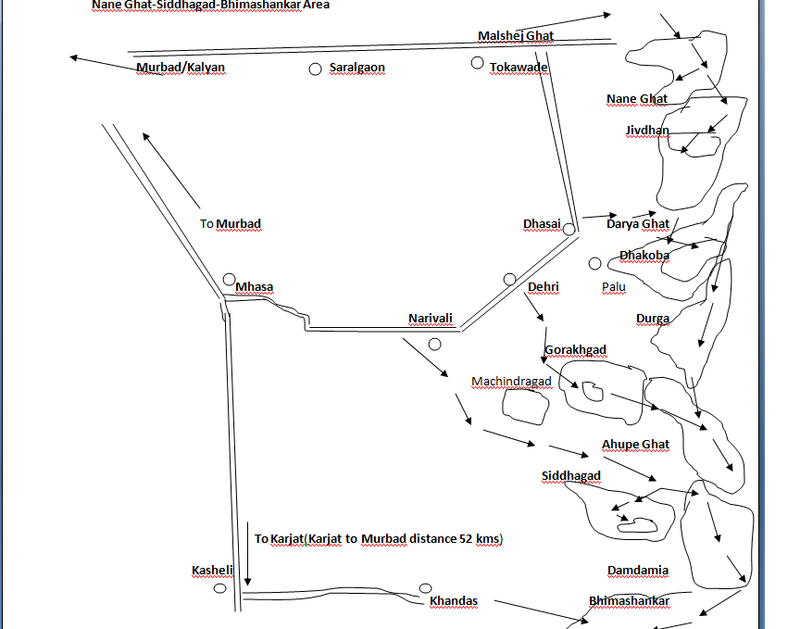 Get down at Bheemkhet and proceed towards Vaghambe. 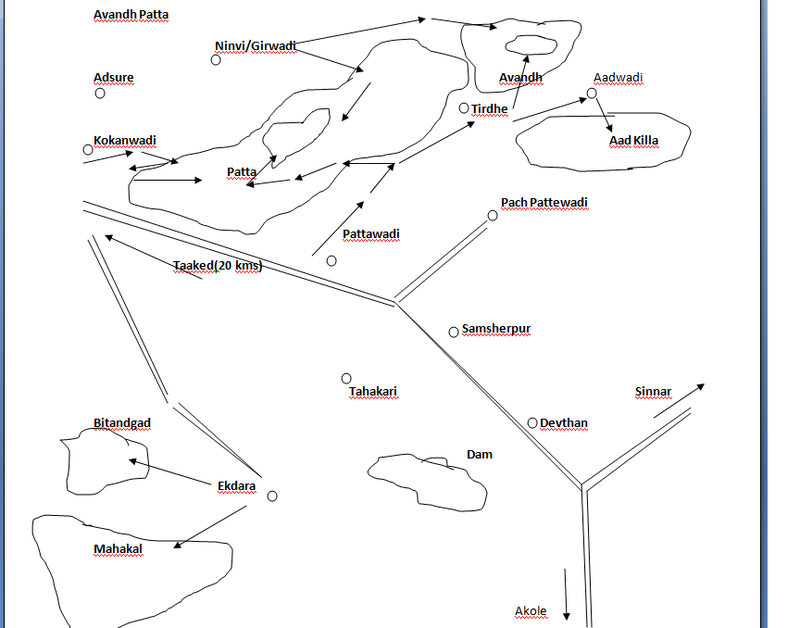 This is basically a tribal region and lot of area falls in the forests of Bhimashankar. Durga and Dhakoba are also located in dense forests. 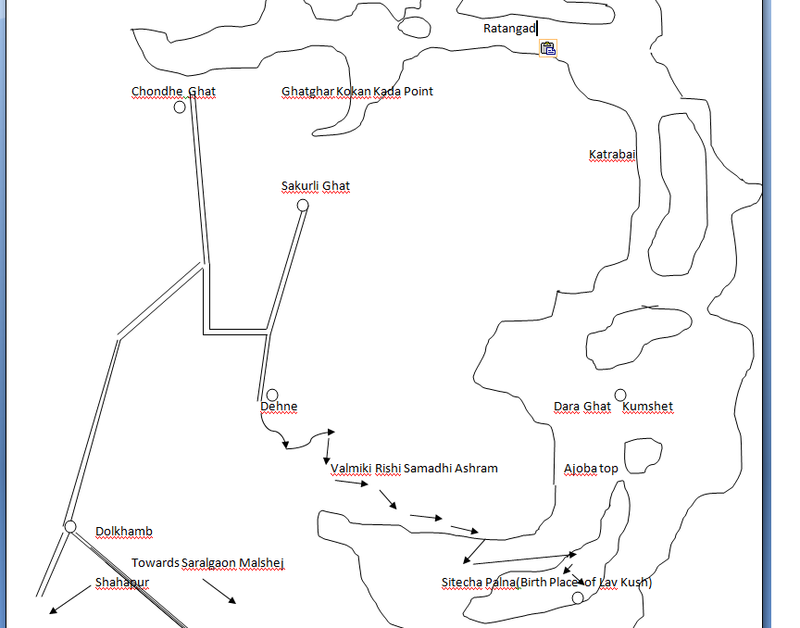 In this whole region,Dhakoba (1264 meters) near Darya ghat is the highest point in Sahyadris followed by Jivdhan and Durga( both are 1175 meters ). 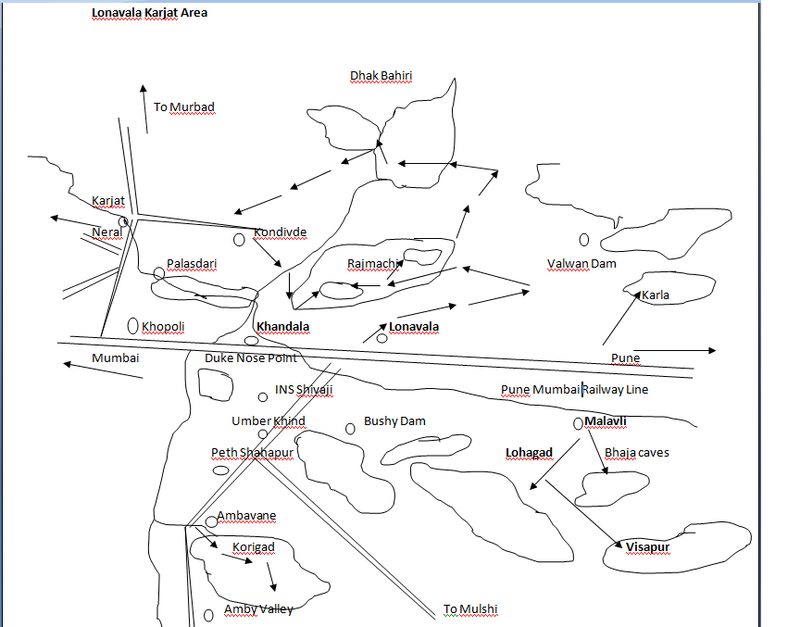 2) Siddhagad(982 meters):Naarivli / Uchale Taluka Murbad Thane dist. This is excellent work.. ! 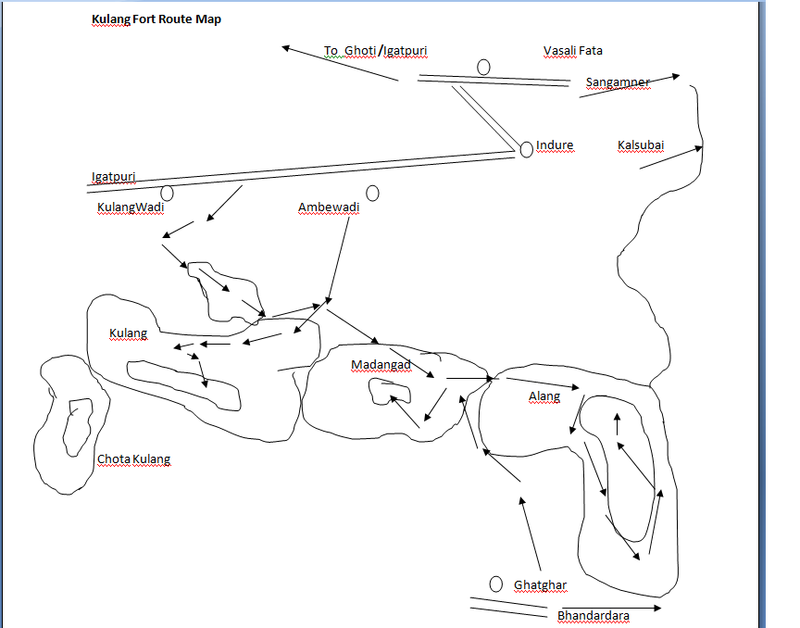 Very good effort to represent the most usefull part associated to trekking. Keep up the effort.. ! Good luck. very nice initiative. 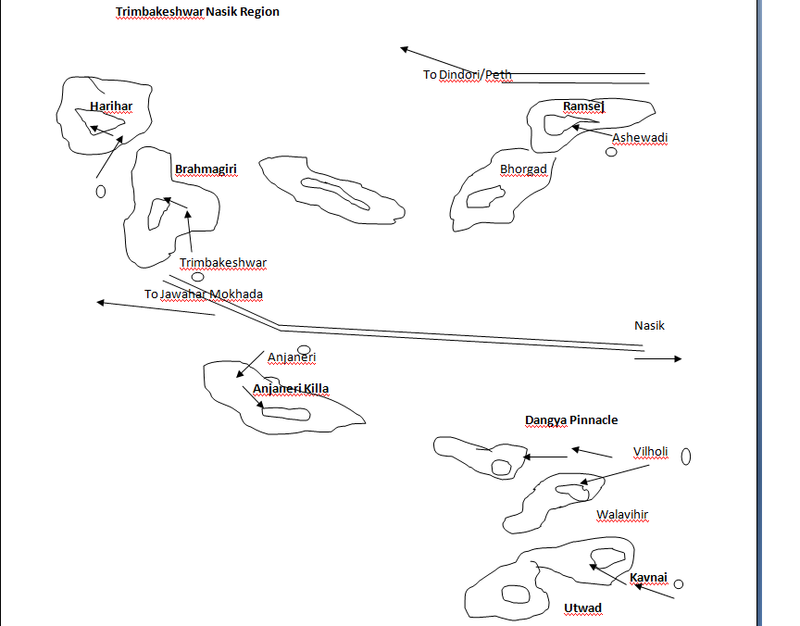 the maps are good and shall help me in my future treks. If you can, please try to incorporate these places, forts in Google maps so it will be helpful on a larger scale and the information gaps will be filled . very useful ! thank u ! Hi Pankaj dada... I have read some of your blogs and have really liked them. 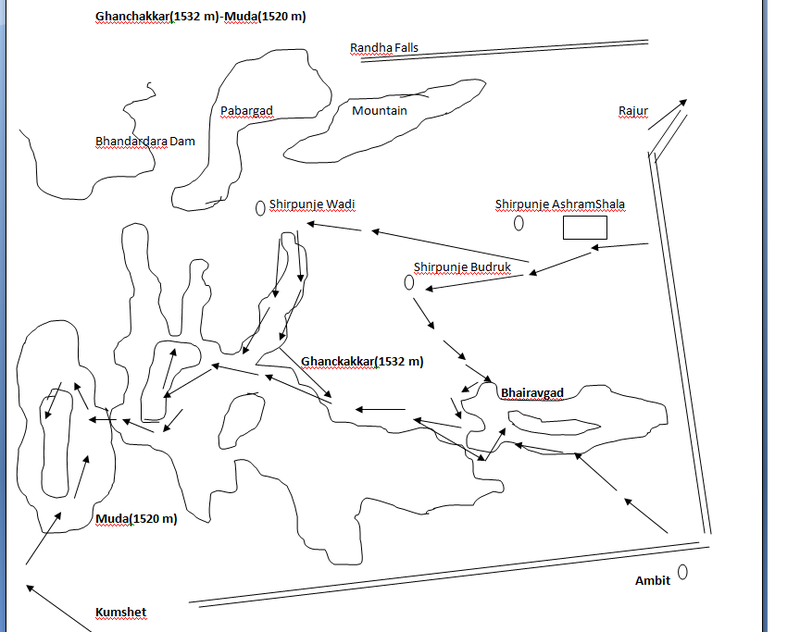 I have a small request to you, could you please write about the Muda, GHanchakkar, Sakirda treks you did. There is very little or no info available on the Internet. Thanks.